Aren’t most wonderful things a little bit strange? 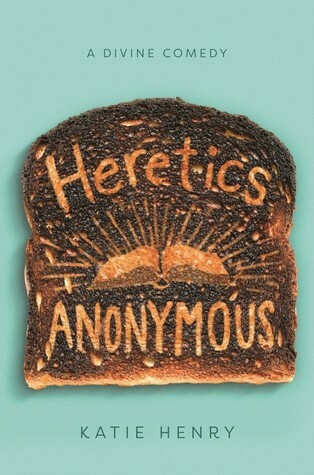 I picked up Heretics Anonymous because the title sounded interesting and I had no idea what it was about. I really enjoyed this read because it was surprising and interesting. I give Heretics Anonymous by Katie Henry four out of five hearts because it was a really interesting and felt very real. Michael feels so out of place in his new school and it makes him feel real. The others in Heretics Anonymous have the same problem. They might seem to fit in, but they each have their own reasons why they don’t fit in. I loved Lucy, she was the one that fit the most with the mentality of the school, but she is super feministic and because of that clashes with a lot of things in the school. It was very nice to read how these characters still loved their school but also had issues with it. Heretics Anonymous is a really quirky read and contains only a little romance and it’s completely reasonable and needed to spruce things up a little. If you want to read something modern and quirky, I would advise you to pick this book up. The book was exactly what I wanted to read at that moment and I didn’t even know it. This entry was posted in Book Review and tagged Book Review, Contemporary, Humor, LGBT, Romance. Bookmark the permalink.